M.D.O.D. : The Snidely Whiplash Inverse Proportionality Theorem of "Family Plans"
I wish this blog were not anonymous because I would dearly love to have this medical theorem named after me. 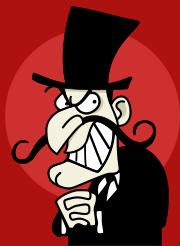 I'll do the next best thing therefore and name it for my favorite arch-villain, Snidely Whiplash (click above to learn about him). I don't know why it irks me so much, but when a nurse comes to tell me that there is a "family plan in room 12" my heart sinks in my chest and I think of stabbing myself through the eye with a pen to lessen the pain I already feel. A family plan means that there is more than one patient from the same family in the room. The 'reasoning' seems to be something like this, "Junior has the sniffles, we can go the the ER for free and we don't have a regular doctor, let's get the whole clan checked out 'just in case we might be getting sick', plus we can get a work note." The chance of any one patient in a room actually being sick enough to require a prescription is inversely proportional to the number of patients in the room. First corollary, the chance of any patient in the room being sick enough to be admitted to the hospital is proportional to the inverse cube of the number of patients in the room. Second corollary, the chance of me ever seeing a dime for the bill generated from the "family plan" approaches the asymptote of zero if the number of patients in the room is greater than two. Ah yes, the family plan. My largest plan was 6 from the same family. Most just wanted "checked out" (read: get a check) after an MVA, which the paramedics said brushed the paint of a small area on the trunk. A former partner handled a similar situation by having all the children do jumping jacks. If they could do them they were discharged. He was able to discharge 5 patients in 10 minutes, start to finish, perhaps a record. Jumping Jacks therapy, that's a good one. This is by far one of the best and wittiest posts I've seen yet. Way to go doc. I'm still reeling about "anonymous". This one is ready to make the jump from theorem to natural law. That means it's okay to remind the family, gently, that they don not belong in the ED and really ought to seek care elsewhere. We had the occupants of a full 15 passenger van in a minor mvc come in once. All the kids were foster kids (?!) and the parents said they were required to have them all checked. Instead of jumping jacks, I had them do the "Hokey Pokey" to work through every extremity. I love the minor MVC ones most. After we triage the group we say: Can you say (insert most well known over advertised local personal injury lawyer) and associates? These people even know what to complain of: neck pain, back pain. All the stuff that will allow the local lawyer and chiropractor to rack up thousands.